Injured on the job? Our EXPERIENCED attorneys handle all types of workers' compensation claims. When you are injured on the job, you need a workers' compensation expert who knows how to handle workers' compensation claims. At Bernstein & Bernstein, one of Southeastern Michigan's largest workers' compensations firms, we are very adept in handling these cases with favorable outcomes for our clients. At Bernstein & Bernstein, we pride ourselves in successfully handling workers' compensation claims of all types, including those involving severe injuries that may permanently impact your quality of life, income or long-term health. Our workers' compensation lawyers have stood up for employee and workers' rights for more than 85 years. They've dealt with toxic exposure, heart attacks, death claims, severe orthopedic injuries and construction site accidents. Our specialists have helped clients recover millions of dollars in work-related injury case settlements. Getting hurt in a work-related injury can be a traumatic experience. Injured workers in Michigan are confronted with a system where insurance companies routinely deny legitimate claims, delay payment of income benefits, refuse to approve necessary medical treatment, and offer low settlements to those who do not have legal representation. Our workers' compensation lawyers help our clients to receive medical benefits, permanent disability compensation, or vocational rehabilitation if needed. 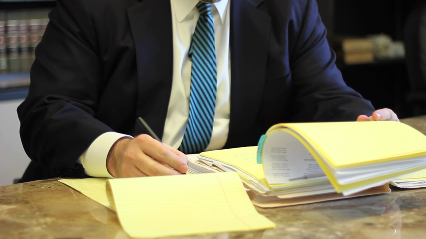 It is simply our commitment to our clients to ensure that each attorney fights tirelessly for your rights. At Bernstein & Bernstein, our workers' comp team has the experience to represent you through every step of the legal process. We will work hard to secure damages for all types of traumatic injuries, occupational diseases and repetitive use injuries. Our lawyers conduct all necessary hearings, settlement mediation and appeals. We will also investigate all avenues of negligence against other responsible parties. When you are injured, the last things you need to worry about are insurance companies, medical bills and loss of wages. It is our sole purpose to ensure that you are treated with the dignity, respect and payment you are entitled to. Our team of professionals will represent your case and we will take these concerns off your shoulders so you can simply worry about recovery. If you are a loved one has been injured in a work-related accident, you need a reputable workers' compensation attorney working on your behalf. At Bernstein & Bernstein, we are standing by to assist. We can also protect your family from unsafe products that you may have purchased. Just contact our office today at one of our 6 convenient locations for a free consultation or use our free email form to contact one of our workers' comp injury lawyer experts. Our workers' compensation lawyers are ready to take on your case and help you get the compensation you are entitled to under the law.